Is this what you had in mind? The life you’re living now, is it how you’ve always dreamt it to be? I mean if you knew then, what you know now, tell me honestly, would you make the exact same choices? Would you pick the same college you graduated from? Hang out with the same friends? Still, marry your current spouse? If you knew exactly what was going to happen, would you make the same decisions all over again? We tend to immerse into an ‘unreal’ past when things go wrong. And the more “if only’s” we accumulate along the way, the harder it gets to trust our own reasoning. Some of us are so traumatized; we’re petrified of making the wrong decision. Instead, we completely freeze and let ‘life events’ take their course. Except the funny thing is, we forget that hesitancy, avoidance, pausing and refusing to make a decision is also a decision, and a terrible one, too! (So frankly, the joke is on us). Psychologists are trained to be mindful of patterns before they can help change them. During our sessions, I note down how many times my patients say the words “I don’t know” when faced with an option. It’s not that they’re clueless or oblivious to their own needs, it’s rather because they fall into one of the following indecision traps. Decision-making is stressful. And that’s extremely unfortunate because when we’re stressed out, we can’t do the one thing we need to do; think outside the ‘familiar’ box. We fall back into our old habits to avoid rocking the boat. “Just keep everything as it is and don’t explore or try anything new” Our brains level with us when we’re anxious. The overwhelming fear of leaving the comfort zone becomes one of the main reasons behind our indecisiveness, hesitancy and/or stagnation. Try asking a teen what he or she wants to be when they grow up, and then watch them get a meltdown faster than a snowman on a heating duct. Every minute of every day we’re bombarded with too much information. There are too many websites, channels and apps to choose from. Too many stores, services, and multifunctional products. The alternatives have become endless; it’s paralyzing our brains. And we can’t help but think choosing one option means missing out on something better. Even when it comes to the simplest things, like ice cream! Do you know how many flavors of ice cream exist in the world today? Over 1000 ‘very-hard-to-choose-from’ different flavors! By the time you’re done trying them all, you’ll be too old to eat ice cream. The more options there are, the easier it is to regret anything at all that is disappointing about the one you chose. It’s one viciously vicious circle! “Perfection prevents action’. I’m not sure who said those words, but they’re my go-to reminder when my daughter tries a new recipe and makes a huge mess in the kitchen. Even though the notion of ‘having it all’ is completely unrealistic, we unconsciously seek it when making a decision, because in this day and age of super technology and endless choices; our expectations are constantly escalating. How many times did you scroll down to read the worst reviews before deciding on which hotel to stay at? How long have you waited to start your ‘dream project’ because the circumstances weren’t ideal? How many proposals do most girls refuse because they’re waiting for ‘Mr. Perfect’? We hold back waiting for signs, for the right time, for someone to make the first move, for when we’re ready and 100% sure…. But sometimes we wait too long, for things that are never meant to be. We can’t decide simply because anything is possible to the extent that ‘perfection’ isn’t an illusion anymore; it sounds so real. There’s a big chance many don’t attempt to succeed because, with all these different choices and available resources, there’s no excuse for failure. And that’s the toughest trap of all…. Seriously, where do awful decisions come from? We’re educated, wise, experienced and we have access to almost all the information we need. The ‘hesitancy dilemma’ aside, we should be aware of the ideal solution or at least the process of reaching it. What is it that prevents us from making the correct decisions? You choose ‘impossible-to-stick-to’ plans because you believe you’re invincible. You think you aced a test and then get the ‘Huh?’effect when you get a B minus. Sometimes because we’re more confident than correct, we subtly decide to overestimate our abilities, and eventually sabotage our own decision-making skills. This is when you stick to your beliefs despite new information that firmly contradicts it. You’re convinced a coworker isn’t smart or competent. And you stick to your judgment even when that person outsmarts or gets promoted above you. Or when you’re in a relationship with someone who isn’t right for you. Even when everyone says you deserve to be treated better, you continue to believe it will work out. Let’s say for some reason you think ‘Range Rovers’ are the kings of all vehicles. Whatever you believe, you’ll make sure to feed it with confirming facts, and if you do happen to stumble on any information to the contrary, you’ll completely ignore it as if it didn’t exist. We all live in an implicit ‘Bias Bubble’ that influences our decisions. Whether or not we mean for them to do so, such biases keep us from being objective when faced with options. Honestly, there’s no definitive guideline called ‘How To Make The Perfect Decision’. People are different and that’s just how it is. Some are logical; they’ll follow textbook advice, writing down pros and cons, trying to calculate the percentages of unforeseen risks before making the final decision. I can go on and on, and that’s why a ‘step-by-step’ method would never work for everyone. Instead, I’d rather focus on the common threads that apply to all types of people. My best friend always says: ‘Never make a decision on an extreme feeling’. The process of making big choices is stressful enough; so don’t let your emotions fog your vision. Practice the pause and take all the time you need. You probably unconsciously do this one all the time. In multiple-choice questions, you’ll pick one answer coz the others don’t look quite right. You’ll settle for this appointment timing coz all the others don’t fit your schedule. When faced with a number of options, narrow them down to the ‘Top Three’ that make the most sense to you. It’s good to be realistic, but it’s even better to be creative, so try to at least pick one ‘sane’ option you’ve never tried before. (Okay fine, you can do the textbook pros and cons too here if you really want to). Do not, I repeat, DO NOT ‘follow your heart’ when making an important decision. The heart can be a blithering idiot, especially when blinded by love, anger or fear. Letting a blind person take the driving wheel on a highway is probably not the greatest decision. Emotions are inconsistent and that’s why most emotional people are not dependable (why was that so hard to admit?). The brain uses a combination of logic and emotions when forming a decision. It’s what we call ‘intuition’ or ‘gut feeling’. Yeah, follow that one. It’s real. And it’s there for a reason. If you’re starting a new business, talk to someone who’s done it before. If you’re considering moving, learning something new, or even redecorating, go to the best and learn from their experiences. Consultation helps you utilize other people’s knowledge in the most efficient way (it’s what we call ‘Shura’ in Islam). There’s nothing you want to accomplish that someone else hasn’t already accomplished. There’s nothing you want to overcome that someone else hasn’t already overcome. And if you don’t have some wise minds in your circle, it’s probably time you find a new circle! What’s important to you? 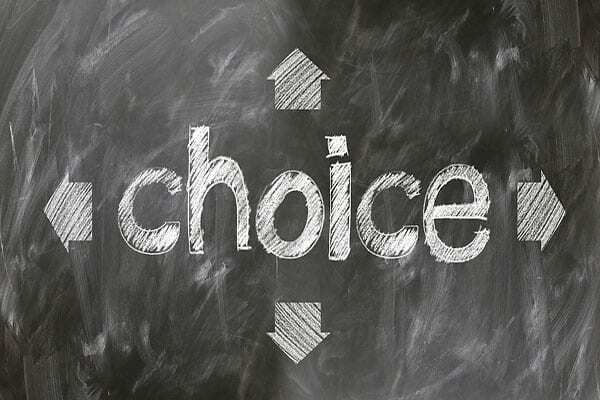 Does your decision clash with your beliefs? Does it unjustly affect or hurt someone else? Is it fair, kind, realistic and reasonable? Big decisions that lack meaning will not take you too far. Give your decision a positive purpose. I think this is one of the ultimate secrets only a few give weight to. There’s glory in involving Allah in our daily lives, our inner struggles, and uncertainties. There’s peace and power and an indescribable serenity when you lay your options before your Lord and humbly ask Him to choose what’s best for you. And there’s a specifically beautiful way to do in Islam. And Power from Your Might and I ask for Your great blessings. You are capable and I am not. You know and I do not and You know the unseen. The best way to make a decision is to actually make it. Don’t let the waiting become an avoidance because it will only get worse the longer you wait. Once you’ve made the decision, there must be no regrets. Because even if it’s incorrect, you’ll always learn something and apply it the next time you’re in a similar situation. So don’t look back. Do your best and trust in Allah . I truly hope you now know how our brains work and will remember those tips, traps, and biases the next time you make an important decision. But I just can’t bring myself to leave without telling you this one last thing…. If there’s one truth you’ll take out of this writing, is that while everything is possible, it’s not possible to have everything. Yes, freedom of choice is liberating, but having too much freedom and too many choices is actually crippling and restraining. Allah gives us the freedom to believe or disbelieve, but once we make that decision, the options are artfully limited. There are five pillars to adhere to, a set of clear ‘halal’ and ‘haram’ to abide by, a specific way to do certain things and a preferred way to do others. There’s a right way and a wrong way and a foundation for each rule, which, if you think about it, makes decisions that much simpler. Because Allah loves us and knows our psychological makeup, He didn’t let us lose ourselves trying to decide our own moral, sexual orientation or gender. The exact amount of freedom that will preserve our joy. Because when your whole life’s purpose is clear, the choices become easier. I guess what I’m trying to say is, every day is an opportunity to transform yourself into a better person and a better Muslim. Make that decision and stick to it. Every day. Now a question to you, dear reader: What was a wrong choice that actually brought you to the right place? And what was a wrong decision that taught you a lifelong lesson?